One of my favorite pastimes is looking through old issues of The Willshire Herald on microfilm at the Van Wert County Library. Below are some interesting articles that I recently found. 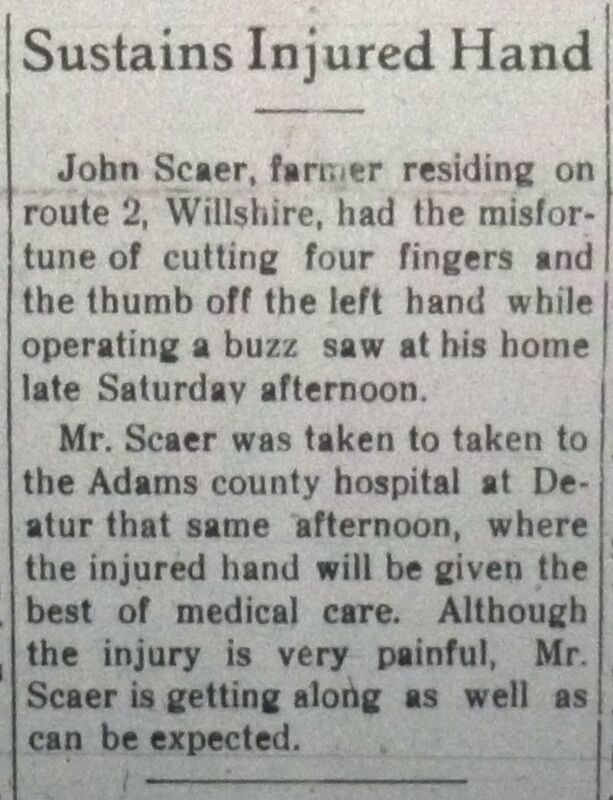 John Scaer, farmer residing on route 2, Willshire, had the misfortune of cutting four fingers and the thumb off the left hand while operating a buzz saw at his home late Saturday afternoon. The Willshire Herald, 12 February 1925, p.1. 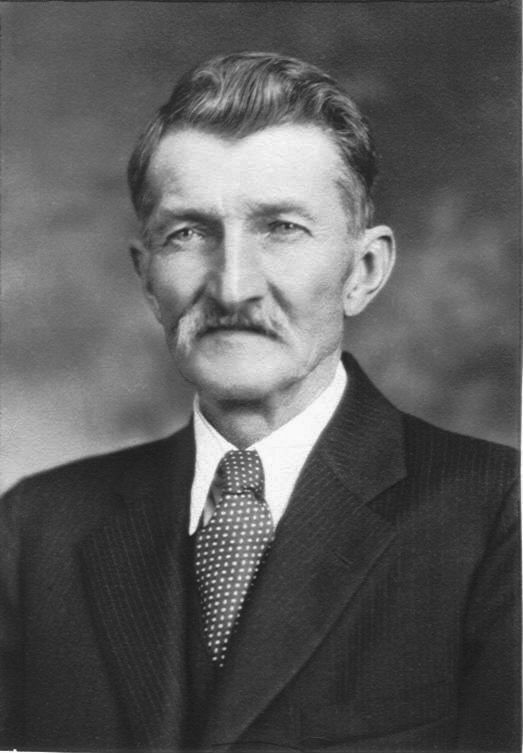 John Scaer was my maternal great-grandfather, the father of my grandmother Hilda (Scaer) Schumm. He was was 61 years old when this accident occurred. The daughter of Wm. Becher got her fingers caught in a pulley and was severely injured while her father was making hay. Geo. Fender was kicked on the arm by a horse, breaking both bones. Mr. and Mrs. Fogle and Miss Rosa Kuehm visited with their mother, Mrs. Wm. Betzel, Sunday. John Bollenbacher and family took dinner with Perry Gibbons and family, Sunday. J.F. Smith and family and Mes Dames Frank Hurl and Clyde Jones of Wren, Ohio, took dinner with H.B. Cowan and family, Sunday. I wonder how just how old you had to be to compete in that fiddlers contest? I wonder if this was the first paved road in Chatt? Rev. Carl Yahl, pastor of the Zion Lutheran Church at Chattanooga, was the victim of a pleasant surprise recently when he drove his new automobile for the first time and found it equipped with a fine radio. Rev. Carl Yahl, pastor at Zion Chatt 1931-42. The news was always interesting back then in The Willshire Herald. The Willshire Herald, Willshire, Ohio, 12 Feb 1925, p.1. The Willshire Herald, Willshire, Ohio, 14 July 1910, p.1. The Willshire Herald, Willshire, Ohio, 1 March 1928, p.1. The Willshire Herald, Willshire, Ohio, 16 February 1928, p.1. 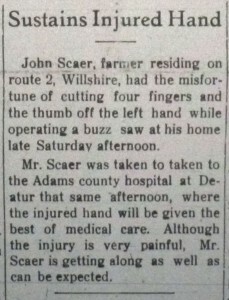 The Willshire Herald, Willshire, Ohio, 18 April 1940, p.1. Yes, they certainly had a different way of phrasing things then. Thanks, Karen, for the news from the Willshire Herald. I didn’t realize it was that old a newspaper. I lived in Willshire during the 40’s and 50’s and read the paper many a time. Even after I graduated and moved away. It was always fun to come home and read Mom’s past papers. Those little newspapers had the best news, didn’t they! Thanks for reading. I was interested in the Willshire Herald entry from March 1, 1928. The Dull Theatre was owned by my great grandfather, Wilbert Dull. My mother, Rosella (Dull) Vining, used to talk about selling tickets in the ticket office at the theatre when she was little. She also talked about have to race into the projection room to fix the projector and film when it “skipped a loop.” If I correctly visualize what she told me, I believe the theatre was located right next to (north of) the old Jones & Byer auto dealer/Sohio gas station. When I was little, Clarence Dailey used to complete auto and tractor servicing/repairs in that storefront building. I think the Dull Theatre was a victim of either the Great Depression or the move to “talky” movies; it shut down in the early 1930s. Thanks so much for posting all this information from the past! I am not sure where the theatre was located but I am sure someone will remember. I see their ad in just about every old issue of the Willshire Herald but do not know when they closed. I will try to notice when the ads stopped. There might even be an article about the closing. Interesting to think of Willshire having its own theatre.